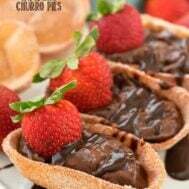 These Chocolate Churro Pies are so easy and fun to make! Fried tortilla bowls get drenched in cinnamon sugar and filled with chocolate pudding. They're crunchy and sweet and the perfect dessert for any day or a party! https://www.crazyforcrust.com/2015/11/double-chocolate-cream-pie/Place vegetable oil in a 2-3 quart saucepan over medium heat. Bring the oil up to about 340-350°F. I like to use a candy thermometer for this. I clip it on the side and then leave it in to regulate the oil temperature. You want the oil to be about 1” up the side of the pan. While the oil is heating, whisk the pudding mix, milk, and vanilla in a medium sized bowl for 2 minutes. Let sit to set. Unwrap the Taco Boats. Place two layers of paper towels on a cookie sheet and set it near the pan where you’ll be frying. Place the sugar and cinnamon in a small bowl and leave it near the cookie sheet. Once the oil is hot, fry the Taco Boats in batches of one or two, using a slotted spoon to help keep them under the oil, flipping as needed. They’ll fry up in 1-2 minutes. Adjust the temperature on the burner as needed to keep the oil around 340-350°F. Remove each shell from the oil and drain on the paper towels. Let sit for a few seconds, until they’re cool enough to touch, then (while they’re still warm) roll them in the cinnamon sugar mixture to completely coat. Once you’re done frying, you can give the shells a second coating of cinnamon sugar, if desired. Once they’re totally cool, fill each with pudding and top with a strawberry.